I am always in search of simple teaching strategies that are incredibly effective, and Alpha Sorts is at the top of my list! Alpha Sorts are a versatile content area reading strategy that I have seen dramatically improve my students' understanding of content-rich vocabulary terms. They give students an opportunity to classify which words are important to a text or concept, verbally express the words within context to their peers, and deepen their understandings of the words. I first heard about Alpha Sorts during my Reading Endorsement classes. We were expected to pick a strategy, implement it in our classrooms, then return to share about it. I was skeptical at first because this strategy seemed so simple, almost too good to be true. But I was pleasantly surprised, and now it has become a staple in my classroom! Build a rich vocabulary as students combine their schema (prior knowledge) with new learning. To activate prior knowledge, introduce the topic to the class. Then have students work with a partner or small group to record the words they associate with the topic. Have students share their words with the class so you can discuss similarities and differences. This is a great alternative to using a KWL chart to record prior knowledge of specific content. To make predictions, have students work independently, in partners, or with small groups to predict specific words the author may use in the selection. To give a purpose for reading, you can instruct students the types of words you want them to find in the text. For example, if you are learning about the Constitutional Convention, you could ask students to find words in the text that describe the qualities of specific delegates that were selected to be a part of drafting the Constitution. To promote close reading of the text, have students use the graphic organizer while they are reading. I typically like to have my third graders read a page or section entirely, then stop to reflect on which words they think are most important to understanding the main idea of that section. At this point, they skim the text again for words that are important and record them on the graphic organizer under the correct letter. To promote deep discussion of the text, have students complete the graphic organizer on their own or as partners while they are reading the text. Afterwards, have individuals meet with a partner or have partners meet with another pair to compare and contrast the words they selected from the text. This gives students an opportunity to verbally explain which words they decided were important and provide a rationale for why they selected those words. To encourage higher-order thinking processes, have students work with teams to revisit the words they selected in order to determine if any words are not as important as they originally thought and therefore need to be removed. Students can draw a line through words they do not think are important anymore. This is a great opportunity for them to verbally discuss why they are making this decision. Students may also add words that are important that they may have missed upon their initial reading. These can be written in a different color, in all capital letters, or circled/starred to distinguish that they were added in round two. To extend their thinking, students can use the Alpha Sort graphic organizer as a support for written responses. For example, the Alpha Sort also doubles as a Word Bank that they can use to prepare a summary of the main idea and details. Students can use the graphic organizer to write questions that can be answered when reading the text, then swap with a partner to let that person answer the questions. It also serves as a great resource for the List-Group-Label strategy and Select Two and Reflect written responses, both of which I explain in more detailed posts. Alpha Sorts are an incredibly easy graphic organizer to make! If you are in a pinch, you can have students fold a piece of blank paper into 4 columns and 6 rows, then label the alphabet letters in each box. (I put P/Q and Y/Z in the same boxes so they all fit on the page.) You can also make one really quickly with a table in a word processing document. 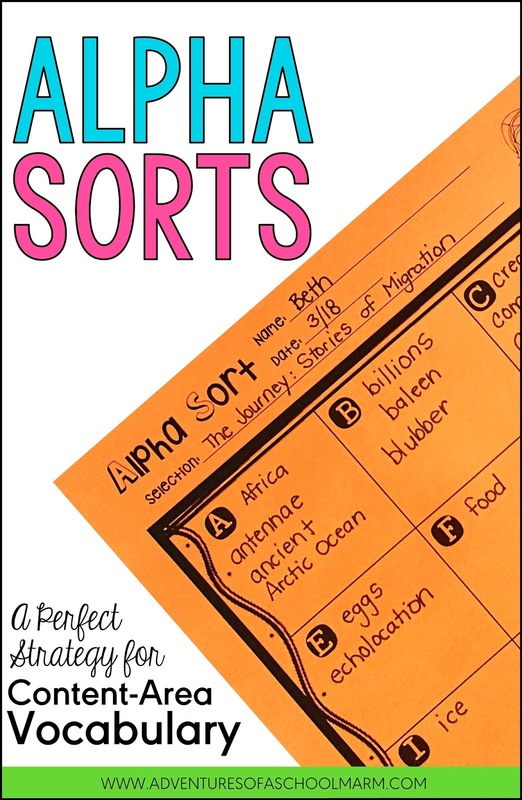 If you are interested in using the Alpha Sort graphic organizer that is photographed in this post, it is included in my Reflective Detectives Graphic Organizers resource (featuring 27 graphic organizers and growing) and in my Reflective Detectives Bundle (including the 27 graphic organizers and differentiated, Mix-N-Match Reading Response Logs). This is definitely a graphic organizer that I keep on hand "just in case" I see an opportunity for it arise during class. The kids also really love using it! Have you tried Alpha Sorts in your classroom? What are your favorite ways to incorporate it into instruction. I would love to hear about it in the comments below!